Are permits required? Yes, but they are free and unlimited. You can pick them up on the day of your trip from the ranger station located behind Steel Visitor Center. How to get to the trailhead: The southern entrance to Crater Lake is the only one that remains open year-round so no matter where you are traveling from you will need to use Highway 62 to access the park. The nearest airport is located 75 miles away in Medford, OR (~2 hour drive). Portland is the nearest international airport but it is a 5 hour drive. When to go: The ideal months to do this trip are February and March. The temperatures are still cool enough to keep the snow in a decent condition (warm conditions = melting, mushy snow = tough to move through) and the days are getting longer, allowing more time for skiing each day. 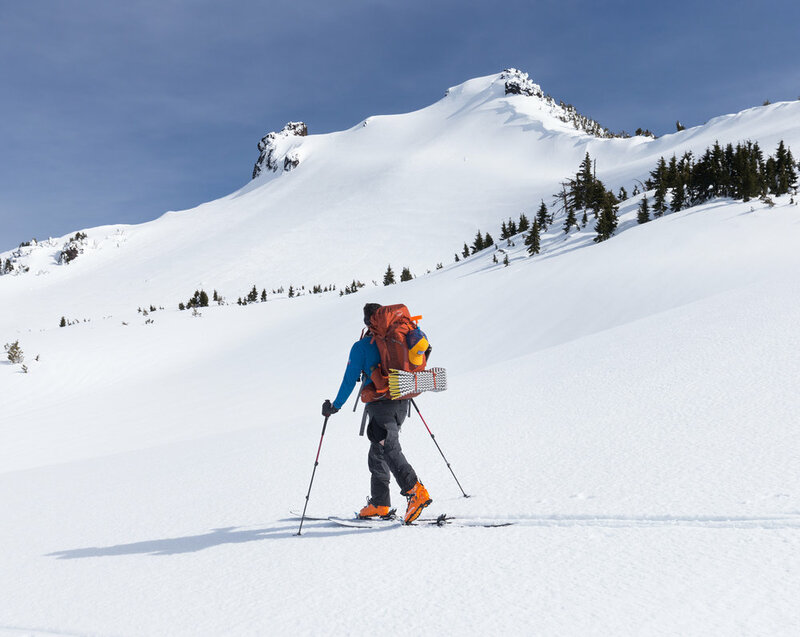 Although this route follows the summer road it can be difficult to navigate at times, especially if others haven't recently skied it, so make sure to bring a map and GPS device to stay on the correct path. The winter season in Crater Lake is notoriously nasty. Days can go by without the lake appearing from the blanket of white that encompasses it so make sure to regularly check the weather before you go to make sure you won't get skunked! The park won't even open the road to the Rim Village if the weather is too poor. There are also avalanche zones along the route. Before heading out check the avalanche forecast here and take the avalanche by-pass routes if necessary. You will need to use either snowshoes or XC skis for this trip. If you don't have your own you can rent snowshoes from the visitor center for $16 per pair + $4 for poles (for a 24 hour period) or XC skis from Diamond Lake Resort for $25/day. While this trail technically begins in the Rim Village you must park at the Steel Visitor Center overnight parking area 3 miles below. To get to the start of the hike you must either hitch a ride with some friendly strangers or ski up the Raven Trail, which adds about a mile to the trek and 1000' elevation gain. We chose to use the latter route and it took us about an hour to navigate uphill. Once on the rim, ski past the Crater Lake Lodge and then traverse the snowy rim until you reach the junction of the West Rim Road and Rim Village Road (about 0.4 miles).